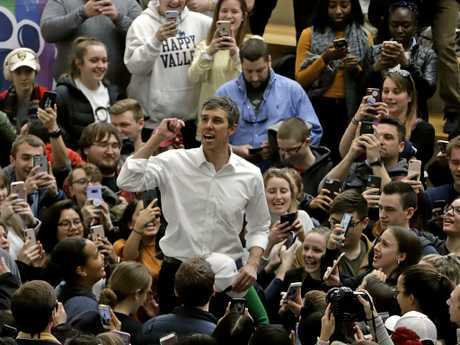 Democratic presidential candidate Beto O'Rourke has rocked America by raising $US6.1 million ($A8.6 million) in the first 24 hours after announcing his campaign, suggesting he could be the challenger to beat Donald Trump. Mr O'Rourke, who has been given the nickname "the white Obama" because of his youth, charisma and progressive politics, brought the highest figure announced by any other candidate from his party. The 46-year-old is fast becoming one of the Democrats' standout candidates, interviewed by Oprah and endorsed by celebrities including Eva Longoria, LeBron James, Jim Carrey, Amber Heard, Alyssa Milano, Travis Scott, Ellen DeGeneres, Lin-Manuel Miranda, Kelly Rowland and Willie Nelson. Mr O'Rourke shot to fame after his surprisingly narrow loss to incumbent senator Ted Cruz in November's midterms in Texas, a state that hasn't elected a Democrat to the senate in 30 years. Some questioned whether he could go all the way against Mr Trump after the loss, but his monumental success this week has changed these perceptions, with top Democrat candidate Kamala Harris only raising $1.5m on her first day. Much rides on finances in presidential elections. Mr Trump has already raised more than $US100 million ($A141 million) for his re-election campaign and spent $US398 million ($A563 million) on his 2016 campaign, while Hillary Clinton spent $768 million ($A1.1 billion), according to campaign finance watchdog OpenSecrets.org. The billionaire businessman was also believed to have received about $US5 billion ($A7 billion) in free media coverage compared with just $US3.24 billion ($A4.6 billion) for Ms Clinton, media analysis firm MediaQuant estimated. Mr Trump and Mr O'Rourke have already gone head-to-head when the Democrat held a huge rally in his hometown of El Paso on the same night as Mr Trump in February. Mr O'Rourke told the crowd at his rally in the Texas border town that Mr Trump was stoking "false fear" about immigrants, while the President called him "a young man who's got very little going for himself, except he's got a great first name". 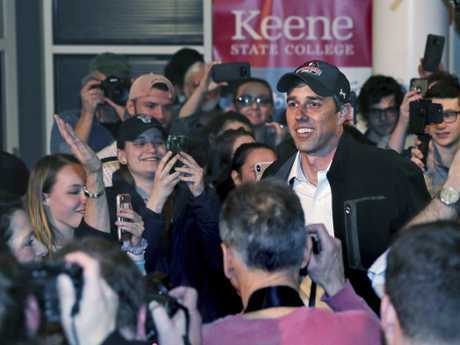 The "Kennedyesque" Mr O'Rourke announced his run for president last Thursday before setting off on a three-day tour of Iowa, the state that will hold the first Democratic nomination vote in February 2020. The rock star candidate has already become known for climbing on tables, chairs and countertops to address listeners, with one person tweeting: "If there's one thing Beto stands for it's standing on tables/counters!" Sitting alongside wife Amy Sanders, the candidate said: "This is a defining moment of truth for this country and for every single one of us. "The challenges that we face right now, the interconnected crises in our economy, our democracy and our climate have never been greater, and they will either consume us or they will afford us the greatest opportunity to unleash the genius of the United States of America. "In other words, this moment of peril produces perhaps the greatest moment of promise for this country and for everyone inside of it." Mr O'Rourke joins a large field of Democrats, polling just below heavyweights such as former vice president Joe Biden and Senator Bernie Sanders. There is also an unprecedented number of female candidates, with Kirsten Gillibrand and Amy Klobuchar among the most popular. 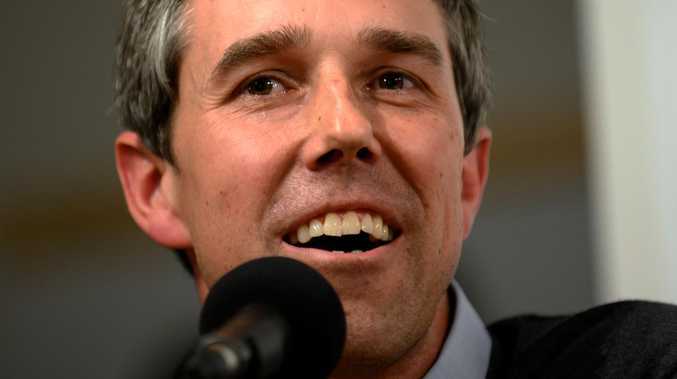 Mr O'Rourke - who has remained in the spotlight since the midterms - was given the nickname "Beto", a Hispanic short-form of "Robert", as he grew up in the Texas border town of El Paso. He served two terms on the El Paso City Council from 2005 before becoming a Texas congressman in 2012. He has campaigned on legalising marijuana, curbing the influence of corporate money in Washington and against Mr Trump's harsh immigration policy. He said NFL players kneeling during the anthem was not disrespectful. 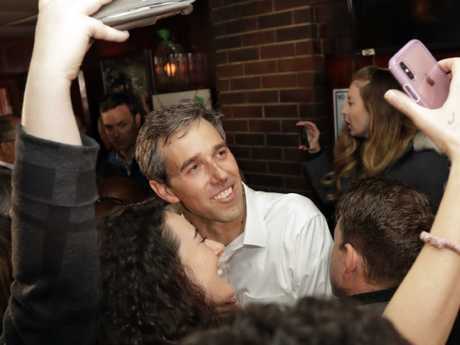 Mr O'Rourke, who loves skateboarding and was once in a punk band called Foss that released the EP El Paso Pussycats, seemingly came from nowhere to almost beat Senator Ted Cruz in the Texas Senate race. His detractors say he is all style, no substance, and does not have the experience of other candidates. 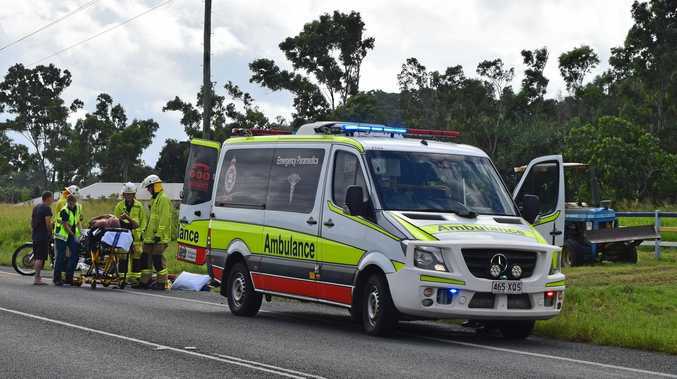 Mr O'Rourke has also been arrested twice - once on suspicion of burglary and on suspicion of driving under the influence after he lost control of his car and hit a truck at speed in the 1990s. Both charges were dismissed, the second after he completed a driving while intoxicated program. On St Patrick's Day this Sunday, the Republican Party tweeted a mugshot of Mr O'Rourke with a leprechaun hat Photoshopped on to his head and the words: "Please drink responsibly". The move was criticised for playing into offensive stereotypes about the Irish community. 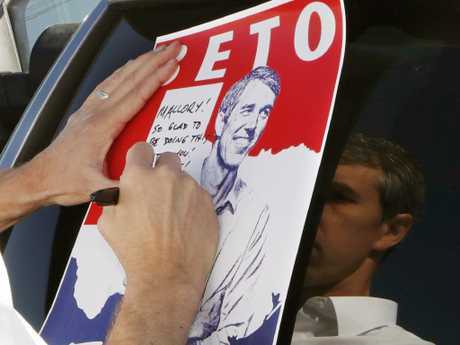 An image of the candidate wearing a sombrero and holding a bottle of tequila was also plastered across a billboard advertising TV show 911, with "Beto runs" pasted over the photo of a car smashing through a building. At an appearance in Madison, Wisconsin on the same day, Mr O'Rourke was asked if he had ever taken LSD and said he had not. He also promised to stop swearing while campaigning, especially in front of his children. "I don't intend to use the F-word going forward," he said. "Point taken and very strongly made … We're going to keep it clean."